The Adapter is designed with TWO electrical receptacles outlets (ports) allow you to plug-in two electrical devices at once. The main outlet at the front is a universal receptacle that accepts all types of connectors (Including: 2-Prong US "polarized", 3-Prong US grounded, European, UK, AUS and India plug standards. But not the large South African plug). COMPATIBLE COUNTRIES: The adapter Type E/F can be used in the following countries: GERMANY, FRANCE, SOUTH KOREA, EUROPE: Austria, Belgium, Czech Republic, Finland, The Netherlands, Norway, Turkey, Poland, Slovakia, Spain, Sweden, Estonia (Exceptions may occur) and Tunisia, Morocco. DESIGN/FEATURES: Built-in Surge Protector. The Adapter is designed with TWO electrical receptacles outlets (ports) allow you to plug-in two electrical devices at once. The main outlet at the front is a universal receptacle that accepts all types of connectors (Including: 2-Prong US "polarized", 3-Prong US grounded, European, UK, AUS and India plug standards. But not the large South African plug). 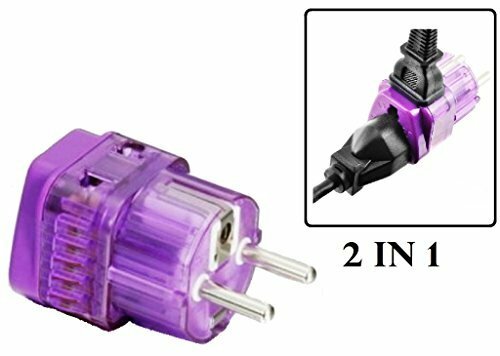 USE THE ADAPTER: The second outlet at the top of the adapter accepts 2-Prong US plugs (polarized too) and European 2-Prong plugs. Please Note! The adapter does not change the Voltage. Please check the voltage standard for the travel destination and use a Voltage converter with the adapter if needed. (example, Europe use mainly 230 Volts). Many electrical devices such as AC/DC chargers for Laptops, cameras etc allow a multi range Voltage (110-240 Volts) and eliminate the need of a Voltage converter. Sometimes electrical device have a switch for either 120 or 230 Volts (remember to set back!). Please check the specifications on your equipment. Powering a 120 Volts device with 230 Volts can destroy the equipment and cause fire.